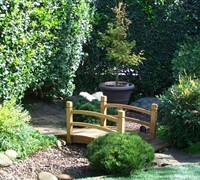 Moonbay is dwarf heavenly bamboo that adds outstanding color and texture to the garden. The fresh, lighter green leaves of this variety turn brilliant scarlet in winter, creating a bold focal point in the winter garden. It has a much denser foliage than most other nandina and does not produce flowers or berries. Because of it's lower habit and outstanding color, Moonbay Nandina is perfect for use as a border or in patches in landscape beds and foundation plantings. 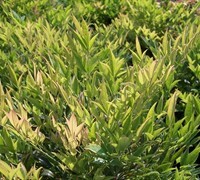 The much-divided leaves of Moon Bay contrast well with heavier-textured plants and add lightness to plantings. Moonbay Nandina is a very easy plant to grow and maintain in locations that provide very well-drained soils and full sun to part shade. It does not require pruning and is deer resistant. This was my fourth order from Gardener Direct.com. In every case the plants were shipped promptly and arrived in excellent condition. All are doing well.